From just an idea to where we are a decade later – it has been an impressive journey… Today we proudly look at what we’re able to deliver with the release of the 10th instalment of our suite of smart home software. Your smart home will now take care of even more tasks in the interest of delivering the ideal room climate. From now on, you no longer have to manually switch between a heating and cooling season – your smart home will now automatically determine whether it needs to heat or cool and which source it should use to do so. Your home now works dynamically with the various integrated heating and cooling sources, including making use of the automatic shading and compatible ventilation systems. This intelligent level of smart room climate control takes care of several tasks for you so that you have time for the more important things in life. 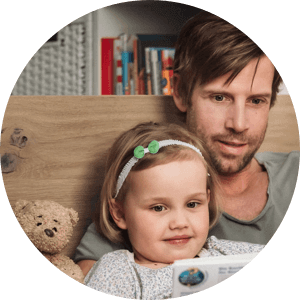 With Version 10, your home will be even more energy-efficient, helping to reduce energy usage and running costs. To do this, your home will automatically determine which heating or cooling source is the cheapest to use to both reach and maintain the desired temperature in each room. Early November, the outside temperature is 13°C and the sun is shining. To avoid having to rely on heating alone, the Loxone Smart Home knows when it will be more energy-efficient to warm up a room with the help of mother nature. To prevent rooms from overheating, your home will recognise the right time to lower the blinds later in the day. At night the temperatures in the bedrooms rise but the temperature outside is cooler. Instead of the home calling for air conditioning to be turned on, the ventilation system kicks in; using the cool outside air to lower the temperature in the bedrooms. The interface for adjusting the room climate is now more streamlined; maximising control but simplifying the process to save you time. 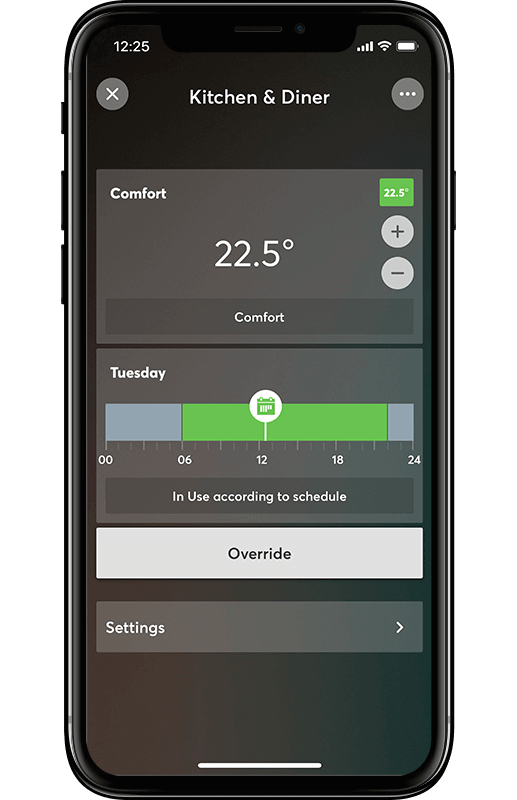 The new ‘Climate Controller’ gives you an overview of the temperature and ventilation (if configured) in each room of your home. You can also see at a glance which room is at the desired comfort temperature or whether it is being heated or cooled to reach this. IN USE: The selected ‘Comfort’ temperature will be maintained. NOT IN USE: The room will be in ‘Economy’ mode with minimum use of the heating or cooling sources. OFF: The heating is switched off to avoid unnecessary energy consumption. Fabric Protection is still maintained at this time. You can also make momentary adjustments to the temperature. A simple tap on the + or – will adjust the temperature in that room for that period. Also new: You can now define a Tolerance for your room climate. This is a permitted deviation from the actual and target temperatures before the heating or cooling kicks in. The higher the tolerance, the more economical. The ultimate smart home health check. Similar to the lights on the dashboard of your car, the System Status feature displays useful information about your smart home – all within the Loxone Smart Home App. 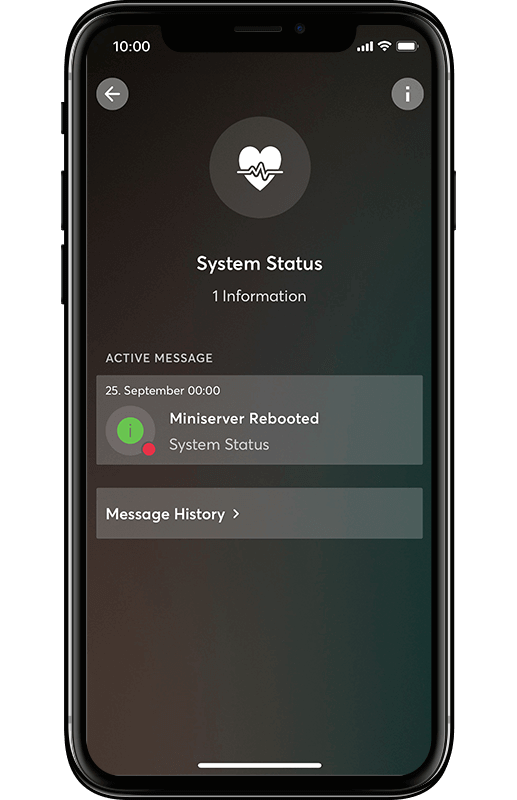 Ranging from general information to crucial messages, the levels of these status messages will be represented by different colours in the Loxone Smart Home App and using the LED lights on your Miniserver. As part of the System Status message, you’ll receive information about a possible solution. 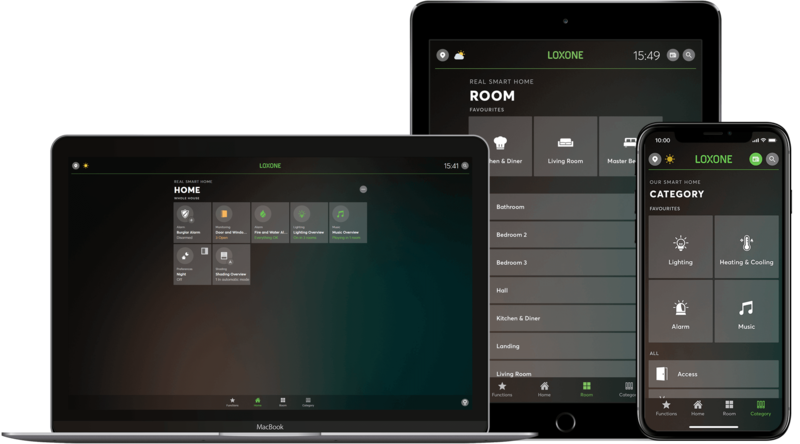 With the Loxone Smart Home App you and thousands of smart home owners around the world hold your entire home in the palm of your hand. It’s important, therefore, that we continually optimise the app to deliver a streamlined user experience coupled with exceptional performance. With Version 10, you can expect improvements and new features galore! Would you like to know what else we’ve included in Version 10? 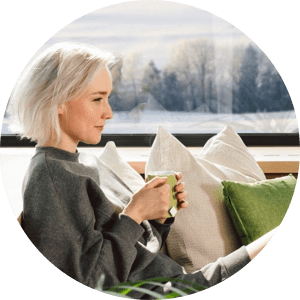 Then chat with your Loxone Partner about updating your smart home and discover all the new features and improvements for yourself. 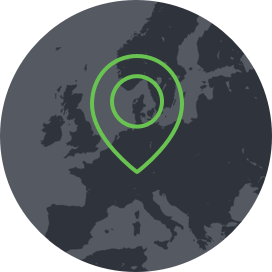 Contact your Loxone Partner now to arrange a visit or remote update so that you can start benefitting from our innovative suite of smart home software! *Some features require configuration by your Loxone Partner. Remember to arrange an appointment to upgrade to Version 10 and make the most of the energy-efficient features mentioned above. Loxone Config 6.3 with a new Energy Manager function block – download it now!